A few days ago, Peter was invited to the Community Table at the Southwest Bistro (SWB) in the Austin Hyatt for a tasting, which was perfect for this installment of Food Photo Friday because the food was beautiful! The Bistro, despite turning out quality local food, might get overlooked because of the lack of visibility from the street level. So, keeping true to our mission statement, this post will hopefully help you discover tasty food, one delicious bite at a time by highlighting some of the dishes at the Southwest Bistro! Seared scallops with orange, arugula, and grilled onions. 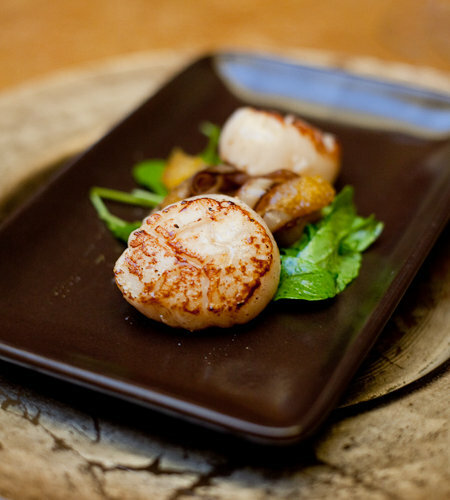 The orange was a great and unexpected pairing with the scallops – who knew that they tasted great together? 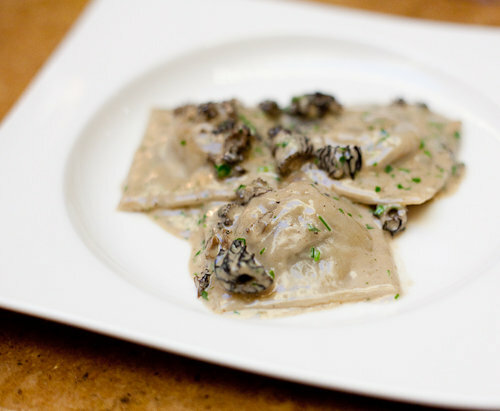 The first picture in this post is a Wild Mushroom Ravioli. 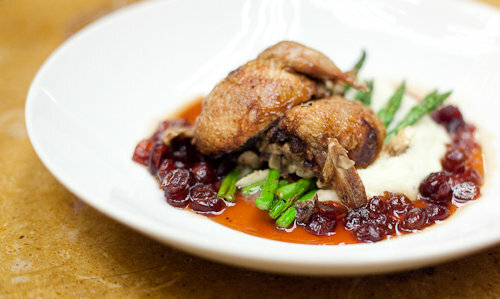 Mushroom and brie stuffed quail with cranberries on top of blue cheese mashed potatoes. This was someone else’s but the bite I took was very nice. 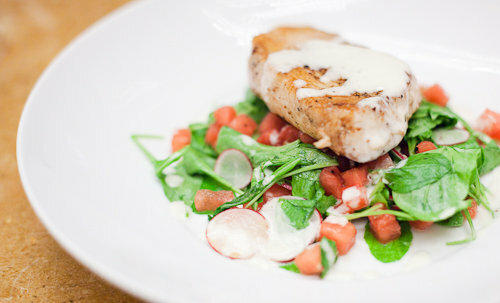 Pan roasted swordfish with watermelon, arugula, radish and lemon shallot vinaigrette. Yet another surprising combination – the watermelon ties this whole dish together and goes really well with the fish and vinaigrette. 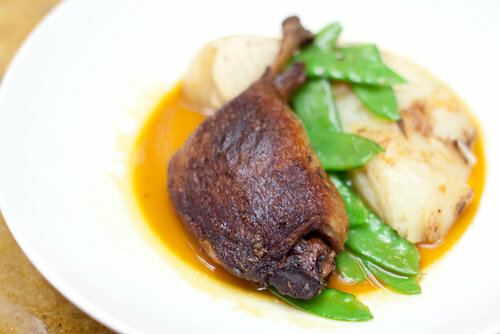 Duck Confit with Orange sauce w/ Manchego Gratin. I only got a tiny bite of this one, but it was probably my favorite. The orange sauce paired with the duck was really tasty. 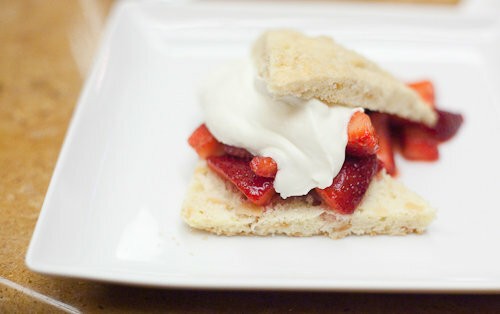 Strawberry shortcake with Texas strawberries and Pure Luck goat cheese. Apparently SWB believes in saving the best for last – this was my favorite part of the entire meal, the best dessert I’ve had in a long time! The goat cheese had a nice kick to it without being overpowering (like some of the goat cheese desserts I’ve had in the past) and the tanginess of the strawberries balanced out the entire thing. Everything in this dessert worked amazingly together – I would go back to SWB just for this dish. So that’s it for this week’s Food Photo Friday. 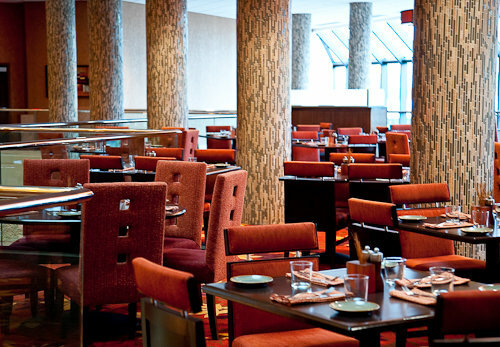 If you feel so inclined, head over to the dining room at the Southwest Bistro (pictured). If for nothing else, go for dessert – I would definitely go back just for the strawberry shortcake! Thanks for the great write up! I’ve posted a link to your review on our Hyatt Concierge Blog. Hope to see you again soon!